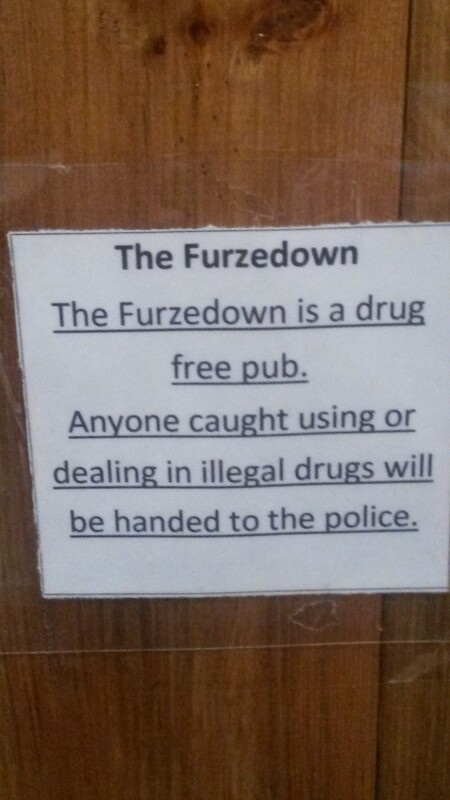 Recently the Better Half and I stumbled into The Furzedown Pub in Streatham, London. From the looks of the neighborhood, I wasn’t expecting much. 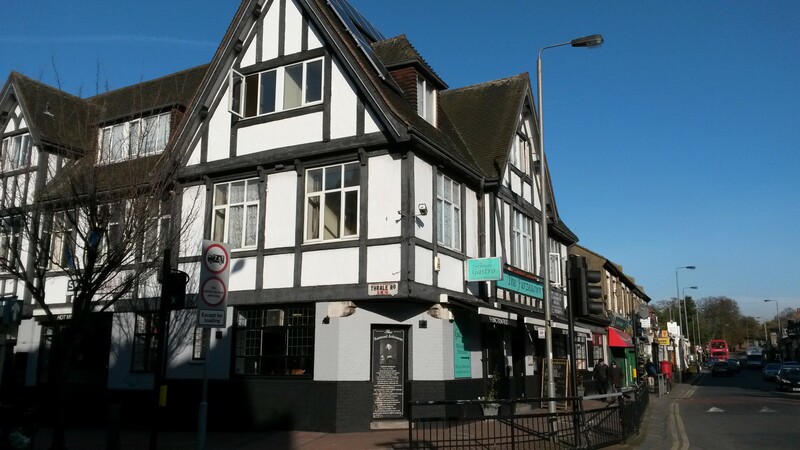 This pub is on Mitcham Lane and many of the businesses have closed up shop. However, I was thirsty and feeling adventurous. And from the outside, the pub looked decent. The first thing that struck me was the size. This pub is huge. Second, I noticed they didn’t have a wide selection of beers. 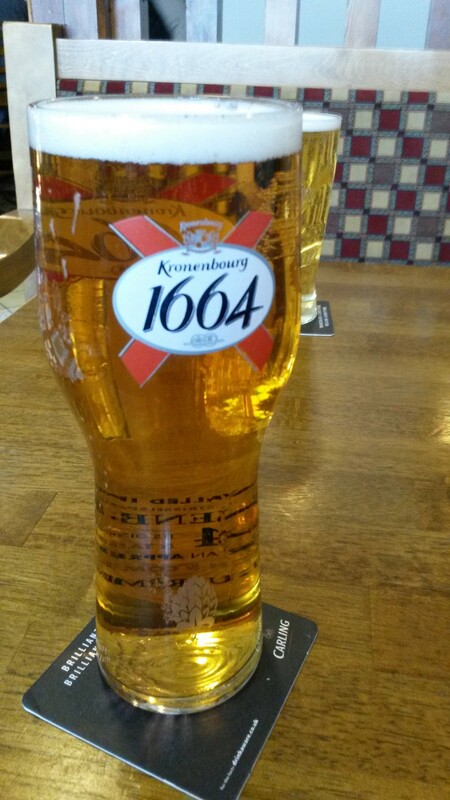 I settled for a Kronenbourg 1664. Sitting at a table I glanced at their menu and saw that their lunch specials included Saturdays. Not the fanciest menu I’ve seen. At first I wasn’t sure I wanted to risk ordering food at this pub. Then again, there weren’t many other options on Mitcham Lane so if I wanted to eat, this would have to do. I ordered the chicken Korma. The Better Half ordered hot wings. For once, The Better Half ordered wrong. My meal was decent for 3.99. The hot wings were battered like fish and chips. It was weird. And THB doesn’t really like fish and chips to begin with so pretty much hated the hot wings. Feeling brave again, I opted to have a dessert. I thought I ordered carrot cake. It turned out to be a carrot dessert of some type, but not one that I had tried before. When the waitress set it down before me I didn’t want to touch it. It looked like cat puke with ice cream. She explained that it was a traditional meal, but I can’t remember from where now. After she left I gave TBH a look that said, “Should I even try it?” TBH shrugged. I was on my own. I will admit that it was actually pretty tasty and I finished all of it. Still think it looks like cat puke. When we arrived the pub was nearly empty. However, when a rugby game started, more people came in. It was a fun atmosphere and we ended up staying a lot longer than we intended. TBH ordered some cheesy fries and I have to say they are pretty darn good. Much better than the hot wings. Just the right amount of cheese and salt. But I forgot to take a photo. Let’s just say, they didn’t last long. Now the next photo is pretty crappy. I’m always somewhat nervous when snapping photos in a pub full of drunk males. However I wanted to share this. 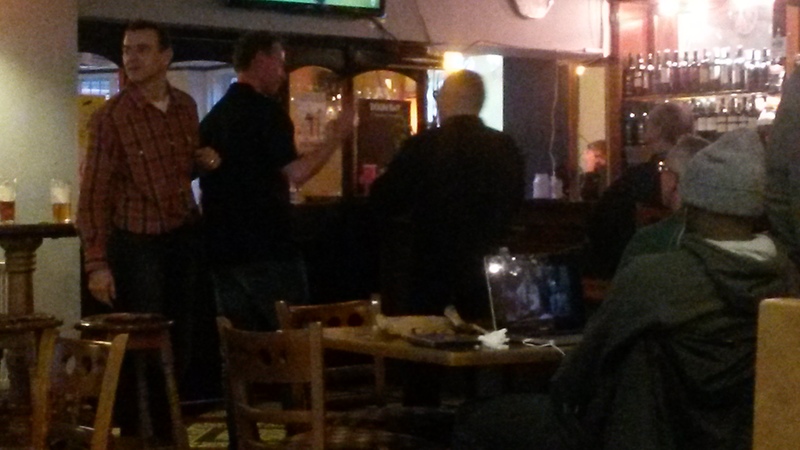 If you look closely, the chap at the table is watching a movie on his laptop. I didn’t ask him, but I’m pretty sure he was watching Twelve Angry Men. I got a kick out of that. 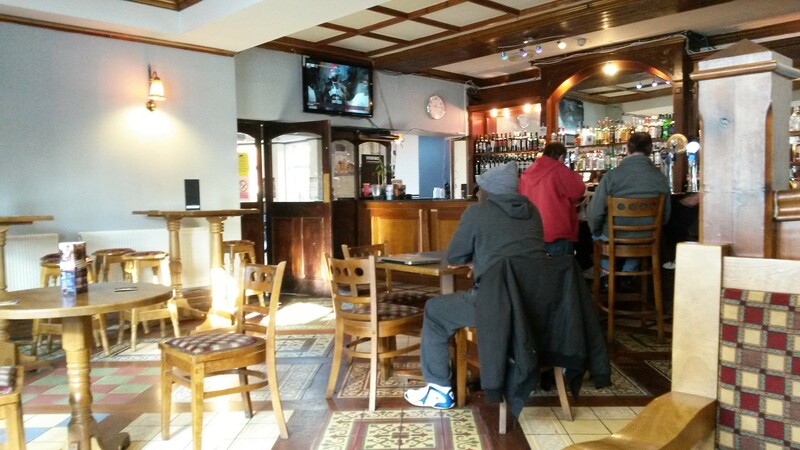 This entry was posted in Weekly Pub and tagged Beer, London, Pub, Pub Review, Streatham, The Furzedown Pub. Bookmark the permalink. hmmmmm not sure is St Reatham (sic its an alternative pronunciation for people who want to pretend it posh) is one of the better parts of London to drink in. those wings look terrifying. the carrot thingy looks pretty sickly too but marginally better. I will say, the beer was nice and cold. I’m American. I like cold beer. The wings were horrible. Even I didn’t eat them, and I usually love all things fried. you do know that they make it cold so that your taste buds can’t recognise what it actually tastes like don’t you. I know, I know, I grew up on flavourless cold beer and English ales revolutionised me understanding of the world, well them along with wine and the rums and whiskies. I can’t do whiskey. Had way too much one night and the rest of the night wasn’t pretty. Even the smell makes me ill. Such a shame, since I used to really like it. I’m the same with Tequila, peach schnapps and any anis based spirits. In fact I should just stay away from spirits and always vow I will but you know how these things happen. I wish I could say I didn’t know how it happens, but I do. I so enjoyed that post. You see. I ate that. Why can’t you eat your cupcake wrapper? Too worried it’ll hermetically seal off the exit…. Nice review, TBM! 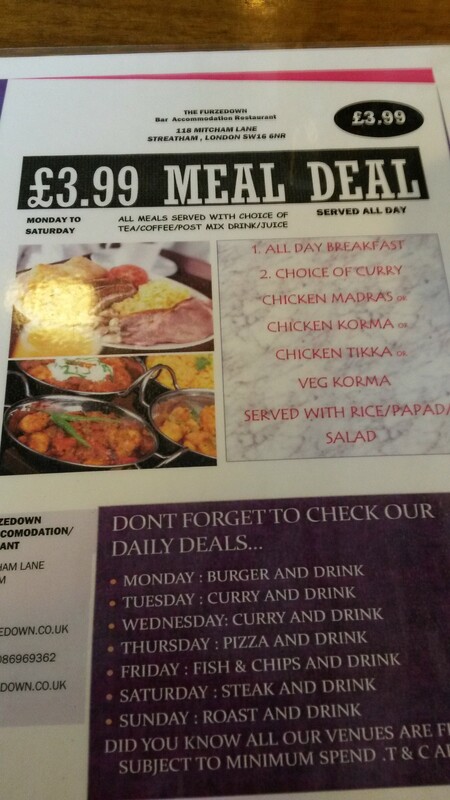 That chicken korma looks very tempting! The carrot dessert looks like the Indian dessert ‘Carrot Halwa’. Sorry to know that you didn’t like its appearance but glad to know that you liked it. 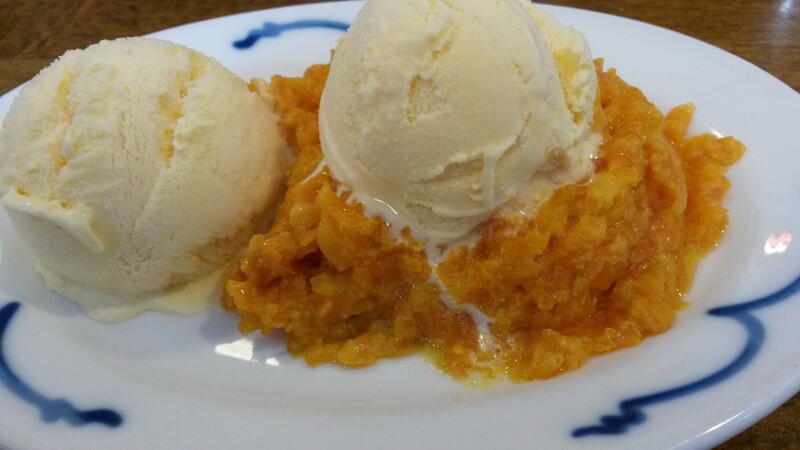 ‘Carrot Halwa’ is very tasty – I love it. Happy weekend! Hey that might be the name of it. Thanks Vishy. It was tasty. I think I was mostly surprised since I was expecting carrot cake, which is much different. But I’m glad I tried it and I would happily order it again if given the chance. Have a wonderful weekend! Have to say, being a sour London boy all my life (although in Spain at the moment) that looking at those kinds of menus in a place like Streatham wouldn’t normally add up to much. (Kronenbourg = lager?). 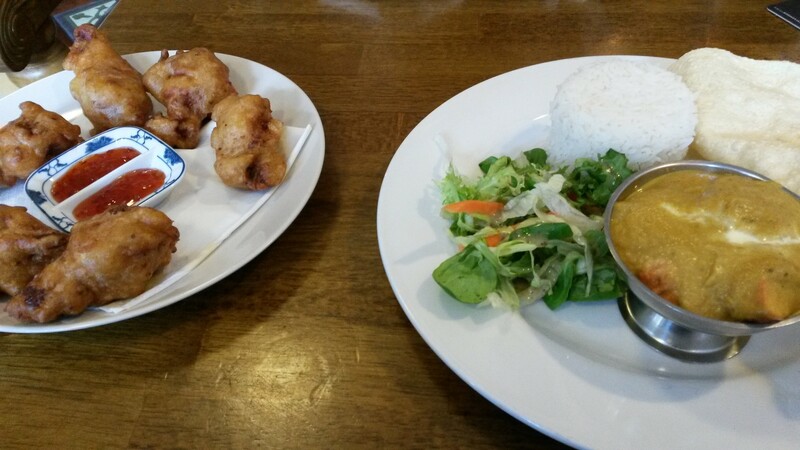 If you want decent pubs and food in southeast/west London – head for places like Greenwich, Chiswick and Blackheath. Oh I’m sure I’ll head to Greenwich, Chiswick, and Blackheath. I’m on a mission to try as many pubs as possible, good and bad. Where in Spain? Souther Spain: Órgiva, La Alpujarra. I’m jealous. I’ve only been to Barcelona, but I loved it there. *ha* a sour London boy…maybe…SOUTH London boy!! Hee hee – I thought it was a new way of saying “saurf” London 😉 I was a Balham/Tooting gal myself. I hope this wasn’t your “Thanks giving” meal. We had a much better dinner for Thanksgiving. Oh dear, I lived not so very far from there but it wasn’t an area I ever thought of going to for a drink. The things you do for us! Yeah I don’t think we’ll be wandering in that direction too often. Yes, that carrot cake DOES look like cat puke. Glad it tasted good. Actually 3 out of 5 stars isn’t bad. We had our first truly atrocious meal in Cuenca yesterday for Thanksgiving. Lesson–don’t expect Ecuadorians to cook a traditional American meal like turkey and stuffing. Hope you all had a good holiday. Did they actually cook turkey and stuffing? That’s sweet, even though it wasn’t that great. Another Thanksgiving memory, though. I am sorry it wasn’t tasty. I was very surprised by that dessert and I would love to have it again. Now when she first set it down, I didn’t think that. Our Thanksgiving feast was much better: steak, stilton sauce, and mashed potatoes at our new favorite pub. Hope you had a wonderful Thanksgiving. When one likes to try different places, risk taking is part of the fun. Of course, sometimes a winner, but not every time. I agree and the memories last longer. Sometimes it’s harder to get the bad ones out of our minds and we’ll giggled about it later down the road. That’s what I like, our bonding time. Consider the bad ones as learning experiences. Yes, you would think that would make me wiser, but I don’t feel it. But it’s still fun trying. The beer looks very refreshing…the wings and carrot dish not so much. But sometimes things that don’t look tasty can surprise you. There was a pub across from my high school that had the best wings ever. It looked like a terrible place from the outside – in a little dingy strip mall – but they had the best food, lots of cold beer, and even great fish and chips. Naturally, I found all that out AFTER high school. sorta. Naturally you waited until after high school just like the rest of us. I do miss decent wings. They are very tough to find in London. Most of the time when they say they are hot wings, they are actually BBQ. That’s not a hot wing! Some of the best dives have wonderful food. I wish I went to your pub for wings and not this joint. Wow, that dessert doesn’t look appealing at all. Glad you ended up enjoying it, though, even though is resembled cat puke! I don’t think I would’ve been brave enough to try it, haha. I’ll pretty much try anything, but when in Paris I couldn’t eat a frog leg. It really looked like a frog leg (I know that sounds silly) and I just couldn’t eat Kermit. Cat puke HAHA!! Glad to hear you survived that experience :). This pub challenge you gave yourself becomes quite the adventure sometimes doesn’t it? I never know where I’m going to end up or what I’ll have to eat or drink. It’s fun, but glad The Better Half is with me most of the time. At least I have someone to laugh with and that’s the best part of this challenge, bonding time over some beers. Having someone to laugh with is one of the most important things of all :). Just from reading this post I had to chew a few Tums. You’re very generous with your stars. This looks like one star at best, if only because (I assume) neither of you suffered food poisoning afterward. I should start including The Better Half’s star ratings since I do think I’m kinder. I usually give the benefit of doubt. And no food poisoning–I was a little nervous about that! I was impressed by their lunch special prices. The food isn’t fancy, but I enjoyed my meal. And good for you! Not one chicken wing in your entire life. That’s admirable. No, you shouldn’t start now and not with these.